Successfully Added iPhone Holder and Charger with LED Flash Light to your Shopping Cart. 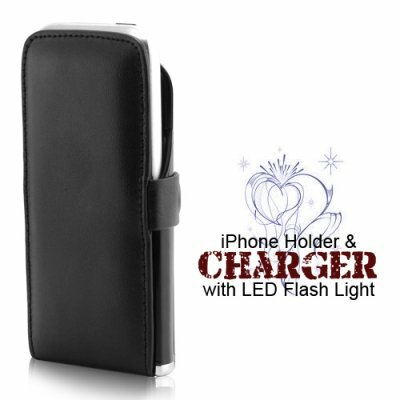 iPhone 2G holder + charger with LED Flash Light for your iPhone. Coming in a black glossy hard back and a high quality leather front cover with a built in LED flash light and a SIM eject-pin that slides out like a stylus. This brand new iPhone Gadget that just hit the market is uniquely designed to keep your iPhone safe with the leather cover to give your precious iPhone that extra protection. Its powerful built in rechargeable 1400mAh li-ion battery provides you with two full charges, that way you can be confident in making the most use of your iPhone apps, such as going online, playing games and listening to music without worrying about draining your iPhones battery power. The LED flash compliments the iPhones camera and provides extra light for clearer picture capturing experience, as well as serving as a regular LED flash light. What's also cool about this new iPhone Holder + Charger with LED Flash Light is the ability to charge your iPhone while in Sync mode, that way you never have to take your iPhone out and Sync it with iTunes on your computer. Whether you are a reseller or just an iPhone owner this hot new item will serve its purpose with excellent performance. The A33 iPhone holder and charger with LED flash light is brought to you by the worlds leading electronics wholesale provider in consumer electronics gadgets, Chinavasion. Will this iPhone holder and charger work on the iPhone 3G and 3Gs? This iPhone battery charger is only designed to work with the iPhone 2G. The iPhone 3G and 3Gs are slitely wider and will not fit in smoothly.